Down at the yard. – Dirty wet dog , boats and sailing. For the last few days of my holiday i have been taking a walk down to the boatyard as part of my back recovery routine : up until today its been grey, wet and pretty miserable for midsummer but today was warm and breeze-y…would have been a perfect day for a sail but checking out WABI”’ on her mooring and poking around the yard and the shed was just about all i could do today. Yesterday i caught up with yard-boss Chris in the shed doing some work on his ‘other’ lugger (Veracity) which seems to have some rot in her bulwarks and upper part of the transom. Chris was telling me about the new big boat in the yard which i had looked at and thought was an old Ron Holland one tonner : turns out i was wrong about the designer as it is a Peterson boat but still a one-tonner and very much the kind of boat that i used to race on back in my Irish sea circuit days. Chris was telling me about her owner who he says i really should do a blog post about as he has done a lot of miles with the boat including several transatlantics….sounds like a plan : anyway as we were talking a big mean and green racing machine (Kawasaki) pulls into the yard and it turns out to be the one-tonners owner, not just a sailor but ex bike racer too !. That’ll be a plan for a future post if i can get together with him. The shed looks nearly full again with quite a bit going on : this little centerboard sloop getting a refit by the looks of the work going on. 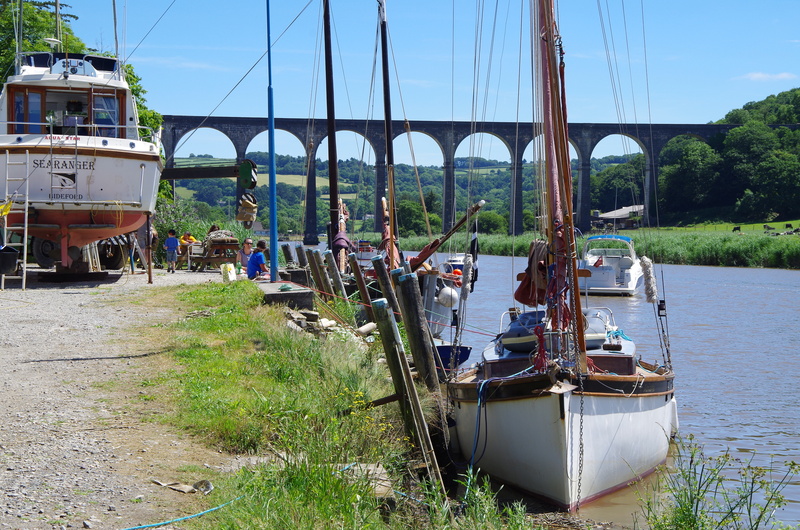 WABI”’ looks fine on her mooring even though i really must try and continue the voyage, maybe next week after my shifts i should look at a move east maybe to Salcombe or up to Kingsbridge.